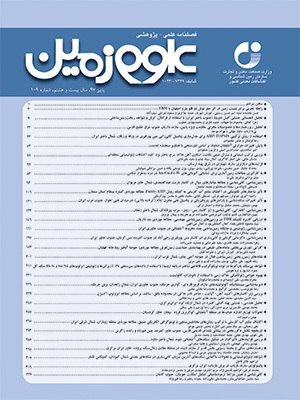 این مطالعه با تلفیق تفسیر خطوط لرزه‌ای دوبعدی، اطلاعات چاه‌های اکتشافی و اطلاعات میدانی به بررسی چگونگی تکامل ساختارها و زمانبندی رویدادهای دگرریختی در پیشانی پهنه بلندای قدیمی فارس، در جنوب خاور کمربند چین‌خورده و رانده زاگرس پرداخته است. در این مقاله با بازگردانی گام به گام برش‌های زمین‌شناسی منطقه‌ای بر اساس الگوی چینه‌های رشدی در نهشته‌های همزمان با زمین‌ساخت و همچنین پایستگی طول و مساحت واحدها، یک مدل تکاملی برای شکل‌گیری ساختارهای پیشانی بلندای فارس ارائه می‌شود. بر اساس این مدل تکاملی، در ائوسن پایانی تاقدیس تابناک با دگرریختی خارج از نوبت در فرادیواره گسل وارون شده پیشانی کوهستان شروع به شکل‌گیری می‌کند. اگر چه در میوسن آغازین چین‌خوردگی جدایشی نازک‌ پوسته در منطقه آغاز می‌شود، اما در زمان میوسن پسین است که آهنگ کوتاه‌شدگی و فرازگیری ساختارها به شدت افزایش می‌یابد، گسلش در پهلوی چین‌ها شکل می‌گیرد و افق جدایش میانی تبخیری‌های دشتک با ستبرشدگی در هسته تاقدیس‌ها درگیر می‌شود. A synthesis of 2-D seismic interpretation, exploration well data and field survey permit us to decipher the structural evolution history in the front of Fars paleo-high area, located in SE Zagros fold-and-thrust belt. In the current study, a structural evolution model is proposed for the region, according to a sequential restoration, which was performed based on the growth stratal unit’s pattern, together with constant length and area assumptions. The result of the sequential restoration indicated that in the late Eocene time, Tanbak anticline incepted on the hangingwall of the inverted mountain front basement fault, as an out of sequence forced fold. Although, thin-skinned detachment folding initiated in the lower Miocene, shortening and amplification of anticlines did not accelarated until the late Miocene time, when thrust faults formed on the limb of growing anticlines while Dashtak middle detachment thickened in the fold crestal areas, likely due to an intensified regional shortening. Agard, P. , Omrani, J., Jolivet, L. and Mouthereau, F., 2005- Convergence history across Zagros (Iran): Constraints from collisional and earlier deformation. International Journal of Earth Sciences, 94(3), pp.401–419. Agard, P., Omrani, J., Jolivet, L., Whitechurch, H., Vrielynck, B., Spakman, W., Monei, P., Meyer, B. and Wortel, R., 2011- Zagros orogeny : a subduction-dominated process. Geological Magazine, 148, pp.692–725. Ala, M. A., 1974- Salt Diapirism in Southern Iran. The American Association of Petroleum Geologists Bulletin, 58(9), pp.1758–1770. Alavi, M., 2004- Regional stratigraphy of the Zagros fold-thrust belt of Iran and its proforeland evolution. American Journal of Science, 304, pp.1–20. Alavi, M., 1994- Tectonic of the Zagros orogenic belt of iran-new data and interpretations. Tectonophysics, 229, pp.211–238. Allen, M. B. and Armstrong, A., 2008- Arabia-Eurasia collision and the forcing of mid-Cenozoic global cooling. Palaeogeography, Palaeoclimatology, Palaeoecology, 265, pp.52–58. Ballato, P., Uba, C., Landgraf, A., Strecker, M., Sudo, M., Stockli, D., Friedrich, A. and Tabatabaei, H., 2011- Arabia-Eurasia continental collision: Insights from late Tertiary foreland-basin evolution in the Alborz Mountains, Northern Iran. Bulletin of the Geological Society of America, 123(1–2), pp.106–131. Beamud, E., Najafi, M., Verges, J., Reza, A., Yassaghi, A., Sherkati, S., Mouthereau, F., Bahroudi, A., Goodarzi, H. and Motamedi, H., 2014- Magnetostratigraphic constraints on the timing of deformation in Frontal Fars Arc (Zagros Folded Belt, Iran). In Évora. Berberian, M., 1995- Master “blind” thrust faults hidden under the Zagros folds: active basement tectonics and surface morphotectonics. Tectonophysics, 241(3–4), pp.193–224. Berberian, M. and King, G. C. P., 1981- Towards a paleogeography and tectonic evolution of Iran: Reply. Canadian Journal of Earth Sciences, 18(11), pp.1764–1766. Beydoun, Z. R., Hughes Clarke, M. and Stoneley, R., 1992- Petroleum in the Zagros basin: a Late Tertiary foreland basin overprinted onto the outer edge of a vast hydrocarbon rich Paleozoic-Mesozoic passive margin shelf. American Association of Petroleum Geologists Bulletin, 55, pp.309–339. Bordenave, M. L. and Hegre, J. A., 2012- Current Distribution of Oil and Gas Field in the Zagros Fold Belt of Iran and Contiguous Offshore as the Result of the Petroleum System. Geological Society, London, Special Publications, 330, pp.291–353. Dahlstrom, C. D. A., 1969- Balanced cross sections. Canadian Journal of Earth Sciences, 6, pp.743–757. DeCelles, P. G. and Giles, K. A., 1996- Foreland basin systems - Reply. Basin Research, 8(2), pp.105–123. Elliott, J., 1990- Teachers as researchers: Implications for supervision and for teacher education. Teaching and Teacher Education, 6, pp.1–26. Emami, H., 2008- Foreland propagation folding and structure of the mountain front flexure in the Pusht-e Kuh Arc (NW Zagros, Iran). University de Barcelona. Fakhari, M. D., Axen, G., Horton, B., Hassanzadeh, J. and Amini, A., 2008- Revised age of proximal deposits in the Zagros foreland basin and implications for Cenozoic evolution of the High Zagros. Tectonophysics, 451(1–4), pp.170–185. Falcon, N. L., 1969- Problems of the relationship between surface structure and deep displacements illustrated by the Zagros Range. Geological Society, London, Special Publications, 3(1), pp.9–21. Falcon, N. L., 1974- Southern Iran: Zagros Mountains. Geological Society, London, Special Publications, 4(1), pp.199–211. Farahpour, M. M. and Hessami, K., 2012- Cretaceous sequence of deformation in the SE Zagros fold--thrust belt. Journal of the Geological Society, 169(6), pp.733–743. Faramarzi, N. S., Amini, S., Schmitt, A. K., Hassanzadeh, J., Borg, G., McKeegan, K., Razavi, S. M. and Mortazavi, S. M., 2015- Geochronology and geochemistry of rhyolites from Hormuz Island, southern Iran: A new record of Cadomian arc magmatism in the Hormuz Formation. Lithos, 236–237(June 2016), pp.203–211. Fossen, H., 2010- Structural Geology,Cambridge press. Gavillot, Y., Axen, G., Stockli, D., Horton, B. and Fakhari, M., 2010- Timing of thrust activity in the High Zagros fold-thrust belt, Iran, from (U-Th)/He thermochronometry. Tectonics, 29(4), pp.1–25. Ghavidel-Syooki, M., 1996- Acritarch biostratigraphy of paleozoic rock units in the zagros basin. Acta Universitatis Carolinea Geologica, 40, pp.385–411. Groshong, R. H., 1999- 3D Structural Geology, Springer. Hessami, K., Koyi, H. and Talbot, C., 2001- The significance of strike slip faulting in basement zagros fold and thrust belt. Journal of Petroleum Geology, 24(1), pp.5–28. Homke, S., Verges, J., Van der Beek,P., Fernandez, M., Saura, E., Barbero, L., Badics, B. and Labrinw, E., 2010- Insights in the exhumation history of the NW Zagros from bedrock and detrital apatite fission-track analysis: Evidence for a long-lived orogeny. Basin Research, 22(5), pp.659–680. Homke, S., Verges, J., Garces, M., Emami, H. and Karpuz, R., 2004- Magnetostratigraphy of Miocene--Pliocene Zagros foreland deposits in the front of the Push-e Kush arc (Lurestan Province, Iran). Earth and Planetary Science Letters, 225(3), pp.397–410. Jackson, J. A., 1980- Reactivation of Basement faults and crustal shortening in orogenic belts. Nature, 283, pp.343–346. James, G. A. and Wynd, J. G., 1965- Stratigraphic nomenclature of Iranian oil consortium agreement area. AAPG Bulletin, 49, pp.2182–2245. Kent, P. E., 1970- The salt plugs of the Persian Gulf Region. Leicester Literary and Philosophical Society Transactions, 64, pp.55–58. Khadivi, S., Mouthereau, F., Larrasoana, J., Verges, J., Lacombe, O., Khademi, E., Beamud, E., Melinte-Dobrinescu, M. and Suc, J. P., 2010- Magnetochronology of synorogenic Miocene foreland sediments in the Fars arc of the Zagros Folded Belt (SW Iran). Basin Research, 22(6), pp.918–932. Motamedi, H., Sherkati, Sh. and Sepehr, M., 2012- Structural style variation and its impact on hydrocarbon traps in central Fars, southern Zagros folded belt, Iran. Journal of Structural Geology, 37, pp.124–133. Mouthereau, F., Lacombe, O., Tensi, J., Bellahsen, N., Kargar, S. and Amrouch, K., 2007- Mechanical constraints on the development of the Zagros folded belt (Fars). Thrust Belts and Foreland Basins From Fold Kinematics to Hydrocarbon Systems, 247-266. Mouthereau, F., Lacombe, O. and Verges, J., 2012- Building the Zagros collisional orogen: Timing, strain distribution and the dynamics of Arabia/Eurasia plate convergence. Tectonophysics, 532–535, pp.27–60. Najafi, M., Yassaghi, A., Bahroudi, A., Verges, J. and Sherkati, Sh., 2014- Impact of the Late Triassic Dashtak intermediate detachment horizon on anticline geometry in the Central Frontal Fars, SE Zagros fold belt, Iran. Marine and Petroleum Geology, 54, pp.23–36. Perrier, R., De Genevraye, P. and Mouille, C., 1975- Khalafani Anticline, Geological survey. Total Iran Petroleum Company. Perotti, C. R., Carruba, S., Rinaldi, M., Bertozzi, G., Feltre, L. and Rahimi, M., 2011- The Qatar–South Fars Arch Development (Arabian Platform, Persian Gulf): Insights from Seismic Interpretation and Analogue Modelling. New Frontiers in Tectonic Research - At the Midst of Plate Convergence, Dr. Uri Schattner (Ed. ), pp.325–352. Pirouz, M., 2013- The Geometry and Sedimentary Record of Tectonics in the Neogene Zagros Foreland Basin. University of Geneva. Pirouz, M., Simpson, G. and Chiaradia, M., 2015- Constraint on foreland basin migration in the Zagros mountain belt using Sr isotope stratigraphy. Basin Research, 27(6), pp.714–728. Player, R. A., 1969- The Hormuz Salt plugs of southern Iran. Reading University. Poblet, J., Mcclay, K., Storti, F. and Munoz, J., 1997- Geometries of syntectonic sediments associated with single-layer detachment folds. Journal of Structural Geology, 19 (96), pp.369–381. Rahimpour-Bonab, H., Esrafili-Dizaji, B. and Tavakoli, V., 2010- Dolomitization and anhydritte precipitation in Permo-Triassic carbonates at the south Pars gas field, offshore Iran: Controls on reservoir quality. Journal of Petroleum Geology, 33, pp.43–66. Ramsey, J. G., 1967- Folding and fracturing of rocks, New York: Mc Graw-Hill. Riba, O., 1976- Syntectonic unconformities of the Alto Cardener, Spanish Pyrenees: a genetic interpretation. Sedimentary Geology, 15, pp.213–233. Ricou, L. E., 1971- Le croissant ophiolitique peri-Arabe: Une ceinture de nappes mises en place au Crétacé superieur. Rev. Géogr. Phys. et Geol. Dyn., 7, pp.327–350. Ruh, J. B., Hirt, A., Burg, J. and Mohammadi, A., 2015- Forward propagation of the Zagros Simply Folded Belt constrained from magnetostratigraphy of growth strata. Tectonics, 33(8), pp.1534–1551. Sadouni, J., 2006- Biostratigraphy and Micropaleontological investigations on the cutting samples of West Assaluyeh Well-1 and correlation with the Kangan and Tabnak well-1 in coastal Fars area, Tehran. Sepehr, M. and Cosgrove, J. W., 2004- Structural framework of the Zagros Fold-Thrust Belt, Iran. Marine and Petroleum Geology, 21(7), pp.829–843. Sepehr, M., Cosgrove, J. and Moieni, M., 2006- The impact of cover rock rheology on the style of folding in the Zagros fold-thrust belt. Tectonophysics, 427(1), pp.265–281. Setudehnia, A., 1978- The Mesozoic sequence in south-west Iran and adjacent areas. Journal of Petroleum Geology, 1(1), pp.3–42. Sherkati, Sh., Letouzey, J. and de Lamotte, D., 2006- Central Zagros fold-thrust belt (Iran): New insights from seismic data, field observation, and sandbox modeling. Tectonics, 25(4), pp.1–27. Soleimany, B. and Sàbat, F., 2010- Style and age of deformation in the NW Persian Gulf. Petroleum Geoscience, 16(Berberian 1995), pp.31–39. Stampfli, G. M. and Borel, G. D., 2002- A plate tectonic model for the Paleozoic and Mesozoic constrained by dynamic plate boundaries and restored syntetic ocean isochrons. , 196, pp.17–33. Stocklin, J., 1968- Structural history and tectonic of Iran. American Association of Petroleum Geologists Bulletin, 52, pp.1229–1258. Stoneley, R., 1981- The geology of the Kuh-e Dalneshin area of southern Iran and its bearing on the evolution of southern Tethys. Geological Society, London, Special Publications, 138, pp.509–526. Suppe, J., Chou, G. and Hook, S., 1992- Rates of folding and faulting determined from growth strata. Thrust tectonics and hydrocarbon systems: AAPG Memoir, pp.105–122. Szabo, F. and Kheradpir, A., 1978- Permian and Triassic stratigraphy, Zagros basin, south-west iran. Journal of Petroleum Geology, 1, pp.57–82. Takin, M., 1972- Iranian Geology and Continental Drift in the Middle East. Nature, 235, pp.147–150. Talbot, C. J. and Alavi, M., 1996- The past of a future syntaxis across the Zagros. Geological Society, London, Special Publications, 100(1), pp.89–109. Valero, L., Soleimany, B., Bulnes, M. and Poblet, J., 2015- Evolution of the Nourooz anticline (NW Persian Gulf) deciphered using growth strata: Structural inferences to constrain hydrocarbon exploration in Persian offshore anticlines. Marine and Petroleum Geology, 66, pp.873–889. Verges, J., Burbank, D. and Meigs, A., 1996- Unfolding: An inverse approach to fold kinematics. Geology, 24(2), pp.175–178. Verges, J., Marzo, M. and Munoz, J., 2002- Growth strata in foreland settings. Sedimentary geology, 146(1), pp.1–9. Verges, J., Saura, E., Casciello, E., Fernandez, M., Villasenor, A., Jimenez-munt, I. and Castellanos, D., 2011- Crustal-scale cross-sections across the NW Zagros belt: implications for the Arabian margin reconstruction. Geological Magazine, 148, pp.739–761. Wang, W., Kano, A., Okumura, T., Ma, Y., Matsumoto, R., Matsuda, N., Ueno, K., Chen, X., Kakuwa, Y., Mahmudy Gharaie, M. and Ilkhchi, M., 2007- Isotopic chemostratigraphy of the microbialite-bearing Permian-Triassic boundary section in the Zagros Mountains, Iran. Chemical Geology, 244(3–4), pp.708–714. Yamato, P., Kaus, B., Mouthereau, F. and Castelltort, S., 2011- Dynamic constraints on the crustal-scale rheology of the Zagros fold belt, Iran. Geology, 39(9), pp.815–818.